Situated in the northeast of the country, Queensland is full to the brim with stunning and naturally beautiful landscapes including the stunning Whitsunday Islands and the forests of the Atherton Tablelands – a rich and fertile plateau situated inland from the city of Cairns on the eastern coast. Of course there are few natural marvels that match the Great Barrier Reef for sheer magnificence. Lying beneath the surface of the wonderfully crystalline-blue Coral Sea, the Reef is home to many species of marine life and is a true marvel of the modern world. Numerous activities are available here such as diving and snorkelling, enabling you to catch the Great Barrier Reef up close and with this sort of opportunity the chance to see the colourful marine life is pretty hard to pass up. Those who prefer to keep their feet on something solid may prefer the glass-bottom boat tours that are available where you can witness the sheer splendour of the reef from the comfort of your seat. Of course there are also enticing cities that you can visit during you trip to Queensland. Visit the city of Brisbane, the third largest in Australia and sample the laid-back lifestyle that is becoming one of the true hallmarks of this wonderful city. Cairns on the coast gains its desirability from the proximity to the Great Barrier Reef. They are fantastic destinations where you can explore true Australian culture as well as view at first hand the wonderful scenery as well as be adventurous and have most importantly, have fun on your holiday. The Australian Gold Coast is aptly named due to the beautiful and golden sandy beaches that occupy this particular stretch of the Australian coastline. The most notable beaches here are Airlie Beach, Mission Beach and Surfers’ Paradise but for those wanting some element of isolation from the traditional tourist beach hotspots, there is nothing like sampling the beaches of Whitsunday Islands. The islands themselves can be described as heaven on Earth as the soft sands, marvellously warm waters and naturally beautiful island interior ensure that you are surrounded by beautifully natural landscape. Lay on the inviting sands of Australia’s Gold Coast. Sample the diving and snorkelling opportunities that are offered. Experience the wonder of the Great Barrier Reef and its tropical splendour. Visit the archipelago of the Whitsunday Islands and feel truly at one with nature. Experience the cities of Brisbane and Cairns and immerse yourself into true Australian culture. Wander the wilderness of Atherton Tablelands with its gorges, waterfalls and forests. If you would like to know more about Travelbag’s excellent tailor-made holidays to Queensland & the Great Barrier Reef, don’t hesitate to contact us on 0203 139 7074. Queensland & the Great Barrier Reef are located on the East Coast of Australia and home to some of the country’s top rated beaches and most beautiful cities. Referred to as the "Sunshine State", Queensland is home to 10 of Australia's 30 largest cities too - so expect a great mix between beach life and city love. 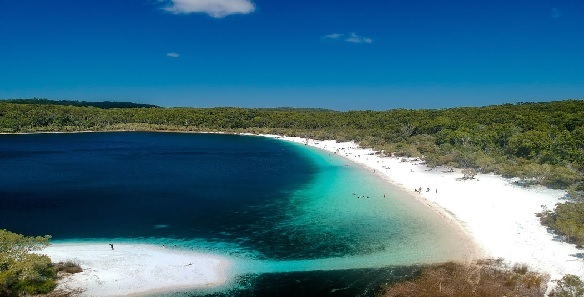 Most people stopping in this part of Australia are hoping to explore the Barrier Reef, so you’ll no doubt need to put swimwear on your packing list. If you’re planning to snorkel or dive the reef, as well as your normal swimming costume or swim shorts, be sure to pack a swim-shirt that covers your shoulders which will prevent burning whilst in the sea. Other packing essentials include; insect repellent (the climate is tropical on the north-east coastline so expect to get bitten often without it), a waterproof camera (for taking some amazing underwater photos) and (last but not least) high factor, waterproof sun-cream. Due to its size, the weather does vary depending on where you are. However, Queensland and the Great Barrier Reef has a slightly more tropical climate than other parts of Australia because the state goes so far north. Prepare for hot and humid days in the summer, and dry and warm days in the winter. In the far northern part of the region, expect monsoonal weather too. Queensland has the highest average maximums of any Australian state, which is where it gets the nickname ‘Sunshine State’. In the tropical north, Queensland summer temperatures can reach over 31 degrees Celsius during the day, with humidity levels around 75%.